Aizu Geek Dojo's SAs (Student Assistants) made the memorial plates for 150 anniversaries of Boshin Civil War using the laser cutter at Aizu Geek Dojo. 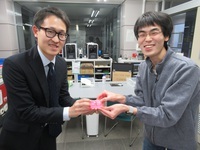 These plates were made as a gift to supporters of Tohoku Electric Power co., Inc. who contributed to planting cherry blossom trees in Tsuruga-jo castle and Aizu Sports Park. We are glad to contribute to society using our skills and our equipment.